Well, it seems as if the weather is finally starting to cool off and the leaves are changing colour here, which has us excited about fall. Canadian Thanksgiving is this coming weekend and we wanted to let you know about our array of products, flowers, centrepieces and baskets available for your big family gathering. Whatever your gathering involves -- families, friends, football, turkey (we hope!) -- a touch of decoration will help put it over the top. Using the warm rustic colours of the season is advised to add a festive flair to the proceedings, and Bloomex has plenty to offer in that regard. Let's get caught up, shall we? First, here's a few lines from our press release from PRLog. Bloomex has introduced specialized products in celebration of the big day in Canada. For example, there's the Burst of Autumn Centrepiece, featuring shades of rustic reds, oranges and lively yellows. 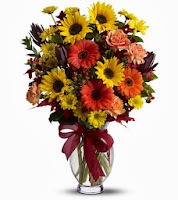 Included are an assortment of Gerbera Daisies, roses, Snapdragons, Lilies and Chrysanthemums, accented with fresh greens and a pair of candles reaching out of the middle. And Bloomex has also introduced special Designers' Collection arrangements just in time for the autumn season. The Designers' Collection puts the choices into Bloomex's talented designers hands, which could work very well for someone looking to take one more thing off their plate as Thanksgiving approaches. There are four models, priced from $25 to $75 with each containing beautiful mixes of flowers. Now, from our Pinterest page: Some Thanksgiving ideas, and some less specific Fall-styled bouquets. Not on Pinterest yet? 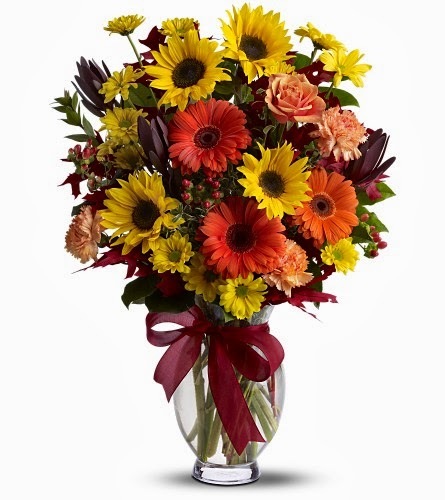 Don't worry, we've got a nice gallery of fall bouquets up on Facebook as well. Meanwhile, if you're getting married, here are some lovely bridal bouquets with shades of orange and red for a classic Autumn look. Whatever you choose, we hope you have a wonderful Thanksgiving this autumn season.